Mostly By Me: So I used a few lines from an old photograph to get the proportions right. 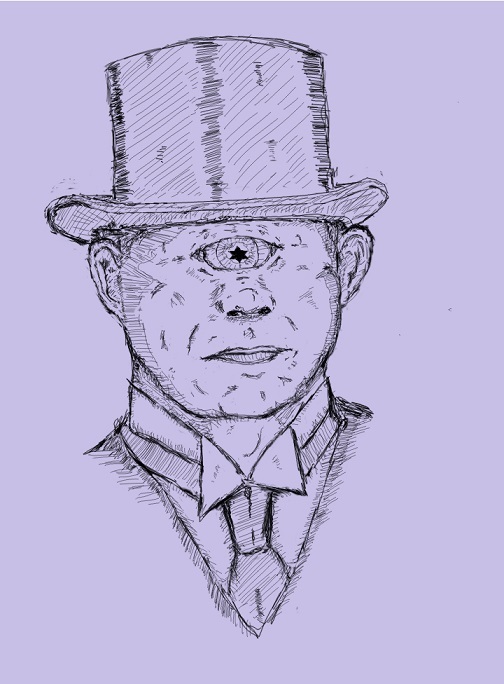 These guys call themselves the Cult of the Oculus Dei, a group of rich industrialists who graft the eye of a unknown being (yeah these are stolen) onto themselves in order to gain a god-like foresight, regular sight, really anything that has to do with perception. They own 'Possible Factories', industrial complexes that randomly generate products, any kind of product (plastic flamingos, armchairs, roses made of gold, etc...). The major problem is they never know what product will be generated from the 'Genesis Fields', a field that randomly generates matter in usually useful shapes. This eye allows them to predict what will be generated that particular day, which allows them to to create and meet demands. This prediction is normally done through advanced predictive mathematics that only has about 30% accuracy rate, but being able to even predict at such a low rate still gives incredible advantages when supplying products to various stores. Anyway, ramble over, I will be expanding these ideas later, but I will be using this pic for my upcoming finish of my random Theology generator.